Structural properties of vascular aquatic macrophyte stems were studied from a mechanical perspective using data from Jackson Lake, Grand Teton National Park, Wyoming. 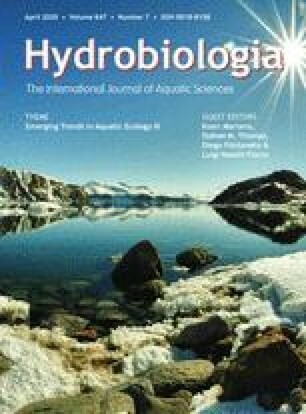 Stem tensile strength, extensibility and cross sectional width were measured for seven vascular freshwater species. Mean values for these properties were significantly different when all species were compared. Moreover, tensile strength and extensibility were significantly different when deep water species were compared with shallow water species. Extensibility was significantly different when species duplicating by clone production were compared with species switching between clonal and sexual duplication, but tensile strength was not statistically different. Force to break a stem was modeled as a significantly increasing power function of stem cross sectional area (R2 = 86.0%). Species specific tensile properties are considered as factors that can regulate the upslope distribution of macrophytes in moving water.